In this design, the 5th string peg is replaced by a permanent capo screw and a machine in the peghead; extra bass string between 4th and 5th strings. 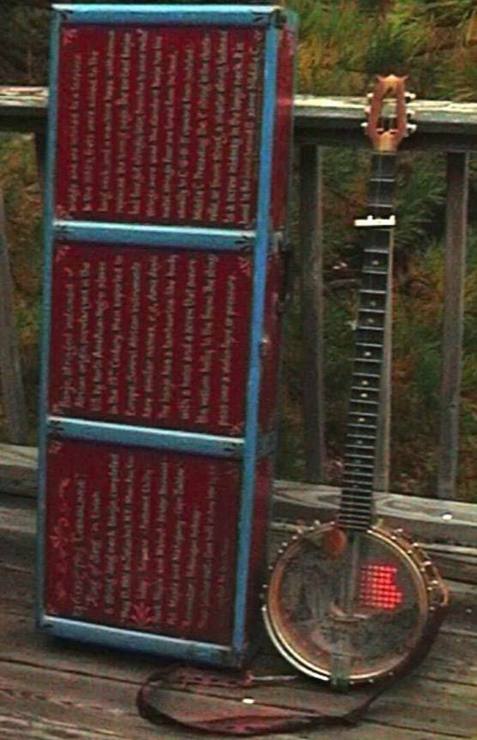 But it's not a "six string banjo" if by that you mean a guitar-banjo: this is a clawhammer banjo, the one heard on Over the Waterfall and Falls of Richmond. Scallopped ebony fretboard, ground turquoise and clear epoxy inlay, maple and walnut neck, maple and mahogany hand-made hoop for the pot; clear mylar head with an ink landscape by me on it. Chrome plated steel Volkswagen hubcap internal resonator. Thumbrest for frailing because the action is so far above the head, for added volume. Plastic pickguard recycled from some home stereo equipment. Box by me, painted by Patricia Windrow. The text is a definition of "banjo" from an encyclopedia.